This time I’m going to talk about the Etude House Play 101 Pencil in number five. This is going to be a short review, so let’s get started. For Christmas I got a package from Jolse, which contained the Play 101 Pencil, and boy, do I love it. This is one of the best eyeliners I’ve ever used, and I used a lot in my day. 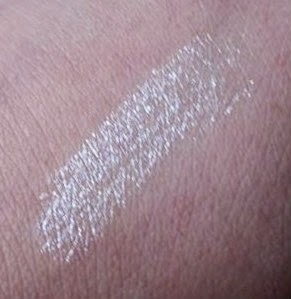 This is an incredibly creamy eyeliner, glides easily onto your lids, and the pigmentation is amazing. You can use it as a highlighter in the inner corners of your eyes, an eyeshadow, or as a facial highlighter if you enjoy glitter on your face. The colour stays incredibly well. I usually put it on in the morning, and it will be still on my face late at night. Which is great, because I am way too lazy to keep my makeup up-to-date. Short story even shorter; I love this eyeliner and really recommend it. You can buy them via the official site of Etude House. I bought it through Jolse, and I got great service, and some great samples with my package. I hope I awakened your enthusiasm for this eyeliner, because I am for sure. Naw thank you so much! That’s so kind! !